He was raised in a conservative household by pro-life activists. If there were ever a poster boy for how cannabis changes attitudes, it would be former cop Nate Bradley. His upbringing in Redondo Beach, and later Sacramento, was far from typical for a man who would one day become one of the most influential cannabis activists in California. Or perhaps, it’s exactly what might be expected. Bradley was born the oldest of six children to a father who was a Pentecostal preacher. His parents, pro-life activists, often took him to meetings and rallies. “We were a very conservative household,” he told GreenRush. As leaders of a group called Operation Rescue, the young Bradley would help his parents block the doors to abortion clinics. But, alongside them, he learned lifelong skills he uses to lobby state politicians for cannabis reform in the halls of the Capitol. Today, Bradley is the Executive Director of the California Cannabis Industry Association (CCIA). The group, which he founded in 2012, includes members ranging from dispensaries to cannabis law firms. They’ve banded together under Bradley’s leadership because of his unique ability to communicate with people who disagree. His skills come from knowing both sides of the aisle, having been the arresting officer for drug offenders and the consultant against police raids for Northern California farmers. In its short history as an organization, the CCIA has played a key role in educating lawmakers on the needs of the cannabis community. In 2015, Bradley helped to negotiate a regulatory framework known as AB-266, which laid out the groundwork for California’s legal recreational market. But Bradley wasn’t always passionate about cannabis. The first time he began really considering the consequences of marijuana criminalization was when he was working as a cop. He went to bust an illegal grow site and the grower answered the door in a wheelchair. Then, in 2009, Bradley developed post-traumatic stress disorder. He was on nine pills daily and, eventually, turned to alcohol too. In a desperate search for a solution, he considered medical marijuana. He claims that the minute he tried it, he felt relief instantaneously and decided to devote the rest of his life to advocacy. His first go at activism was with a local cannabis advocacy group that discovered his incredible knack for public speaking. 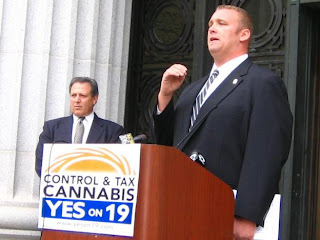 Bradley quickly became the voice of cannabis activism in northern California and traveled from rally to rally promoting Proposition 19, the failed 2012 referendum to legalize a recreational market in California. Though the referendum failed, Bradley went on to start a group called Lawmen Protecting Patients and helped Yuba County farmers reach a deal with their local government. He then founded the CCIA to help take his activism across the state. Ultimately, Bradley’s work helped pave the way for a second shot at a recreational referendum—this time with total success. The recreational marijuana market opens in California today.